The word ‘conservation’ often conjures up images of iconic wildlife such as elephants, whales, tigers and pandas. One imagines them roaming in the wild amid lush forests or savannas or swimming in the vast blue sea. There is also another side of conservation that is far less visible or rather, difficult to visualize and that is the complex and relatively long, arduous process of protecting the habitats and ecosystems where these iconic species live and that communities living around them depend on for their well-being and livelihoods. As part of our efforts to ‘decode conservation’, this article aims to explain how areas are identified for protection for conservation purposes, the determining criteria and the different processes that usually follow. To do so, we will look at the specific case of Messok Dja in the Republic of Congo (RoC) where exactly such a process is currently underway. It is important to note that these efforts and processes are led, first and foremost, by governments in line with national conservation and sustainable development plans and priorities. For example, protecting Messok Dja, which you will read about in an instant, is part of the Republic of Congo’s efforts to meet its international obligations under Aichi Target 1 of the UN Convention on Biological Diversity (CBD). Other institutions and civil society organizations such as WWF come in support, depending on the presence, expertise and capacity they have in country. WWF’s Living Planet Report 2018 shows that unsustainable human activity has severely impacted the habitats and natural resources that wildlife and humanity depend on such as oceans, forests, coral reefs, wetlands and mangroves. 20 per cent of the Amazon has disappeared in just 50 years and we have lost about half of the earth’s shallow water corals in the past 30 years. On average, we’ve seen an astonishing 60 per cent decline in the size of populations of mammals, birds, fish, reptiles, and amphibians in just over 40 years. As we erode these natural places and nature, we are undermining their ability to provide the supply of fresh air, clean water, food, energy, medicines and other products and materials we all depend on, along with the other species we share our one planet with. This is why, at times, it is important to put in place strengthened protections for a specific area or ecosystem and Messok Dja is one such place. It is part of the Tri-National Dja-Odzala-Minkebe (TRIDOM) landscape which is one of the most intact forest blocks in the Congo Basin. The region is home to the largest elephant population in the Congo Basin, western gorillas and central chimpanzees, 11 species of monkeys, three species of pangolin, the endangered African grey parrot, the enigmatic Picathartes and the majestic crowned eagle. 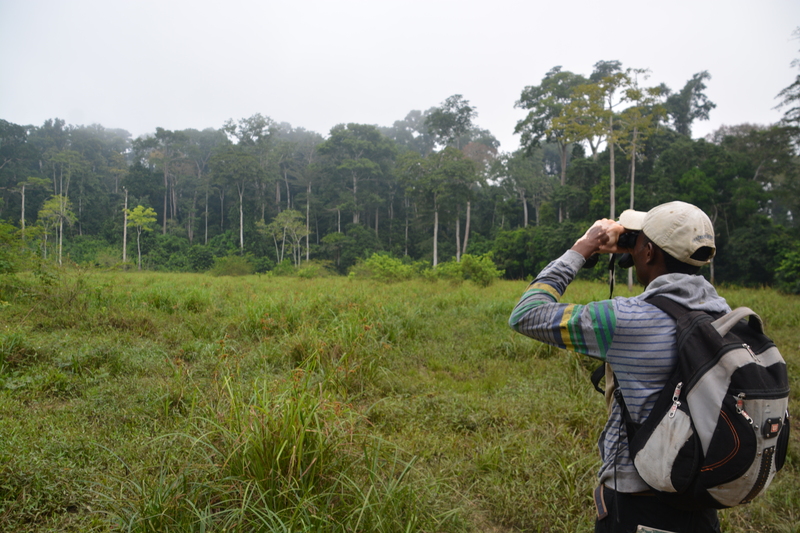 A recent WWF biodiversity survey of the Messok Dja forest found its dense foliage to be an important migration corridor for animals between National Parks in Cameroon and Republic of Congo. Alongside this incredible wildlife indigenous peoples depend on the forest for food, medicine, housing and much more. Protecting this ecosystem from degradation or deforestation is key to all of their health, well-being and future. But at present, the Messok Dja forest is part of two commercial logging operations which does not provide sufficient protection. The legal provisions to create or strengthen protections for a specific area or landscape differ from country to country. In the Republic of Congo land use and ownership can be either individual or collective and is determined by the ownership of land titles. Still, land can be expropriated by the state for public utility purposes. Rights to land and use for Indigenous communities in the Republic of Congo are recognized by law, even in the absence of a land title. But at present there is no national government policy or decree on the implementation of this law, leading to challenges in claiming these rights in practice. The creation of any type of protected area is always at the discretion of the government, which also decides the category of protection. Messok Dja falls under the Forest law, which demands both logging concessions designate a part of their concession as a conserved area, where they cannot harvest trees. This is called a serie de conservation. Both companies have agreed to place their serie de conservation in the Messok Dja forest. This however only protects this forest as long as the same company holds the concession rights. Therefore, a discussion is underway between the government and the two logging companies to establish long term protection of the Messok Dja forest - and its unique biodiversity. As the government deliberates, we at WWF feel it is critical all stakeholders are consulted, importantly local and indigenous communities. This is in line with our belief that people and conservation are two sides of the same coin, as outlined in several WWF policies, such as WWF's Statement of Principles on Indigenous Peoples and Conservation and WWF’s Policy on Poverty and Conservation. Internationally, this is known as the process for Free, Prior and Informed Consent (FPIC). Even while there is a provision for FPIC in Congolese law, that law currently has no decret d' application which means it is not being implemented. Therefore, WWF has been advocating for the government to apply an FPIC approach for the creation of the future Messok Dja protected area. Without a legal framework in place, the work is undoubtedly challenging but we remain committed to follow best practices based on FPIC procedures that are in use elsewhere. In addition, we are consulting and advocating for the inclusion of a formal process of FPIC in the new Congolese forest code bill, currently awaiting adoption. The first step in an FPIC process is to identify stakeholders and we have initiated a participatory land use proces to see who is using the Messok Dja forest. As a next step, we intend to bring in additional external support through a consortium of three NGOs, two Congolese and one Gabonese, specialized in socio-economic issues to help ensure a proper FPIC in the process to change the status of Messok Dja. The consortium is called Cercle des Peuples Autochtones de la Sangha (CPAS). The culmination of these efforts could be a final act or decree awarding a stronger protection status for Messok Dja, one of the Congo Basin’s most biodiverse sites that underpins the health and well-being of its ecosystems, wildlife and communities. But the communities can also refuse or propose a different future for this forest. The way the process evolves cannot be foreseen and can take years - the government of the Republic of Congo first started considering a different protection status for Messok Dja in 2011. WWF remains committed to do our best to ensure we can work together with all stakeholders to identify the best way forward to protect these lands and the people and species that depend on it.